You don’t actually have to pay off your student loan early. In some cases, it might make sense to pay off your debt slowly. When I first started my career as a freelance writer and financial expert, my main selling point was the fact that I had paid off my student loans early. I did it in three years. While I’m still proud of that accomplishment, I did it because that was the best decision for me. That doesn’t mean it’s the best decision for everyone. There are plenty of factors that could have made my debt strategy pointless – or even downright harmful. I constantly meet and consult with people who would be better off paying their student loan debt down at a slower rate. When you shouldn’t pay off your student loan early. If you have other debt. Student loan debt typically comes with lower interest rates than other forms of debt. Plus, the interest is deductible on your taxes. It’s better to pay off credit card debt or other high-interest loans before focusing on student loans. Once those high-interest loans are paid off, pay off any loans with comparable interest rates, since they’re unlikely to offer the same tax benefits as the student loans. If you qualify for a forgiveness plan. Anyone who qualifies for a loan forgiveness plan through the federal government or other organization, such as the Public Service Loan Forgiveness program, should make the smallest payments possible on their loan — especially if they won’t owe taxes on the forgiven debt. If you’re in this situation and pay more than you have to every month, you’re just throwing money away. If you don’t have an emergency fund. Paying extra on your student loans only makes sense if you already have an emergency fund in place. An emergency fund allows you to pay cash for crises like car accidents or hospital stays, and without one you may have to use a credit card or high interest loan. Save at least $1,000 for an emergency before putting extra money on your student loans. An emergency fund allows you to pay cash for crises like car accidents or hospital stays. Without emergency savings, you may have to use a credit card or high-interest loan. Save at least $1,000 for an emergency before putting extra money on your student loans. If you have a low interest rate. Many people only make the minimum payments on their student loans if they have a low interest rate. Instead of putting extra money toward their debt, they can earn a higher return by investing that money in the stock market. It might seem crazy to willingly carry debt, but the math could work out in your favor. For example, students who took out federal student loans after 2016 have a 3.76% interest rate, while many index funds have an average 10% rate of return. It might seem crazy to willingly carry debt, but the math could work out in your favor. For example, students who took out federal student loans after 2016 have a 3.76% annual interest rate, while many index funds have an average 10% annualized rate of return. Investing isn’t a sure thing, though, so make sure you think it through before taking the plunge. If you aren’t saving for retirement. Saving for retirement should be the most important financial priority for anyone, including millennials and Gen Z. Paying off your student loans early is a valiant goal, but it shouldn’t distract you from saving enough for your golden years. You should be saving between 10% and 15% of your income for retirement before you even consider putting extra cash towards your student loans. 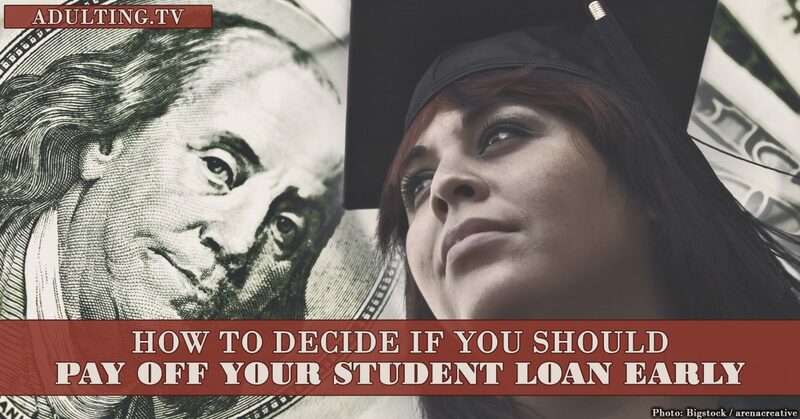 When you should pay off your student loan early. If you don’t have other financial obligations. There are very few reasons not to pay off your student loans early if you’re already saving for retirement and are otherwise debt-free. Paying your student loans off early could save you thousands in interest – and make it easier to save for other goals like a vacation abroad or a new car. Being debt free will also increase your credit score and make it easier to apply for a mortgage, business loan or rewards credit card. Paying your student loan off early could save you thousands in interest – and make it easier to save for other goals like a vacation abroad or a new car. Being debt free will also increase your credit score and make it easier to apply for a mortgage, business loan or rewards credit card. Being debt free will also increase your credit score and make it easier to apply for a mortgage, business loan, or rewards credit card. If you have a high interest rate. When I graduated and started paying my student loans, my interest rate was 6.8%. That rate is comparable to what I could’ve earned if I invested my money in the stock market. In that instance, paying off my student loans and saving on interest made more mathematical sense. I saved more than $5,000 in interest by paying off my loans early. In that instance, paying off my student loans and saving on interest made more mathematical sense. I saved more than $5,000 in interest by paying off my loans early. If you get anxious about your debt. A study published in the European Journal of Public Health found that adults with debt suffered from significantly more mental health issues than those without. It’s not surprising, given the omnipresent weight that debt represents. Debt can cause constant pressure. You feel the nagging at the back of your brain. Paying off your student loans earlier can relieve anxiety, stress, and depression, plus increase your quality of life and stifle that subconscious negativity. If you want to switch careers or start your own business. Not having to pay on your student loan every month frees up your budget for other things. It allows you to switch to a low-paying job you love or even become self-employed. Becoming debt free faster means you can gamble on your salary without the risk of missing payments or defaulting on your loans. Where do you stand? Are you aggressively paying your student loan early? Or are you taking it slow?